Menopausal Combo in a new higher 200C potency to address symptoms due to hormonal imbalance, perimenopause and/or menopause. Menopausal Combo offers relief for the emotional or physical symptoms that women experience prior and after menopause. Menopausal Combo is a unique formula to Elixirs.com. Oophorinum is included for hormonal balance during perimenopause. Oophorinum supports ovary gland function. The ovaries produce oestrogen and progesterone. Oophorinum 200C can help even out hormonal fluctuations. Oophorinum 200C is included for night sweats, hot flashes. Oophorinum helps with acne that is worse during menses, water retention, menstrual irregularities, and peri-menopause. Oophorinum is also listed as Ovary Gland. The ovaries produce hormones even after menopause and Menopausal Combo can be used in addition to Estrogen Replacement Therapy, ERT. Use Menopausal Combo as a substitute for Klimaktheel by BHI/Heel. Menopausal Combo is offered as complementary alternative medicine (CAM). Information on this kosher parve product. Information on the manufacturing process for this product. 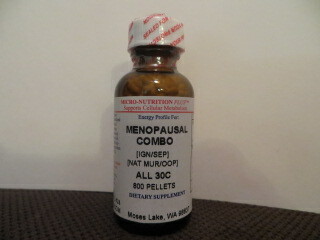 Menopausal Combo 200C potency in an economy 1 oz bottle of 800 pellets with 265 doses. Pellets are in a base of sucrose and cornstarch. Combination product formulated by Kathryn Jones Homeopathic Specialist. One dose is 3-6 pellets taken at one time. Can slowly dissolve, chew, or place under the tongue. Take one dose 3 to 5 times daily when needed for relief of symptoms. Decrease dosing frequency as improvement is made. Additional dosing can be used nightly for nighttime symptoms.